Do you want to build a podcasting website to host and promote your podcasts? 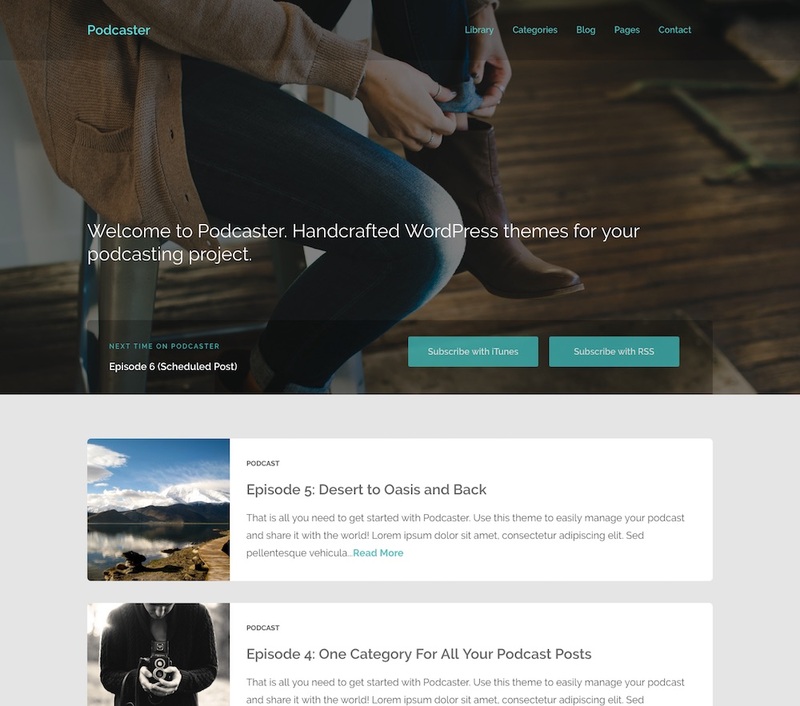 This is a collection of the best podcast WordPress themes designed specifically for Podcasters. WordPress is a popular and excellent platform for building a Podcasting website due its flexibility, ease of use, and abundance of theme designs and podcasting functionality plugins. Lets take a look at some of the best podcasting themes for podcasters that let you to build a professional and modern podcast website quickly and easily with WordPress. Podcaster is a multimedia theme build specifically for Podcast websites. The theme has a clean and flexible design and allows you to showcase and manage your podcasts. It supports and is optimized for the Seriously Simple Podcasting and Blubrry PowerPress podcasting WordPress plugins. Remote posting is also supported. The custom FrontPage design welcomes your visitors and allows them to watch or listen to your featured podcasts. It also has a podcasts archive where you can upload a featured image for podcasts to be used as a cover podcast items. 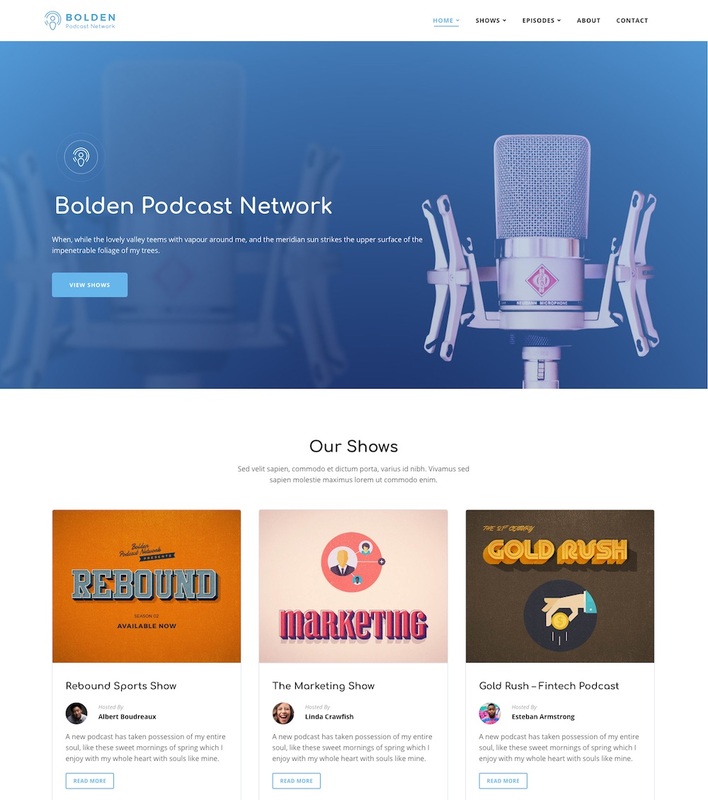 Bolden is a Podcast WordPress theme built specifically for podcast networks and supports a multi-show layout. The premium theme is ideal for podcasters or podcasting networks that want to showcase multiple podcast shows. It also works great for single podcasts as well. It includes lots of design options and customization settings to display your content in a unique and custom design. Bolden supports multiple podcasting plugins such as PowerPress, Castos (aka “Seriously Simple Podcasting”), Simple Podcast Press and more. It also supports locally hosted and external MP3 files, or embeds such as Libsyn, SoundCloud, MixCloud, YouTube, Vimeo etc. The theme supports the latest version of WordPress and the new Gutenberg editor. 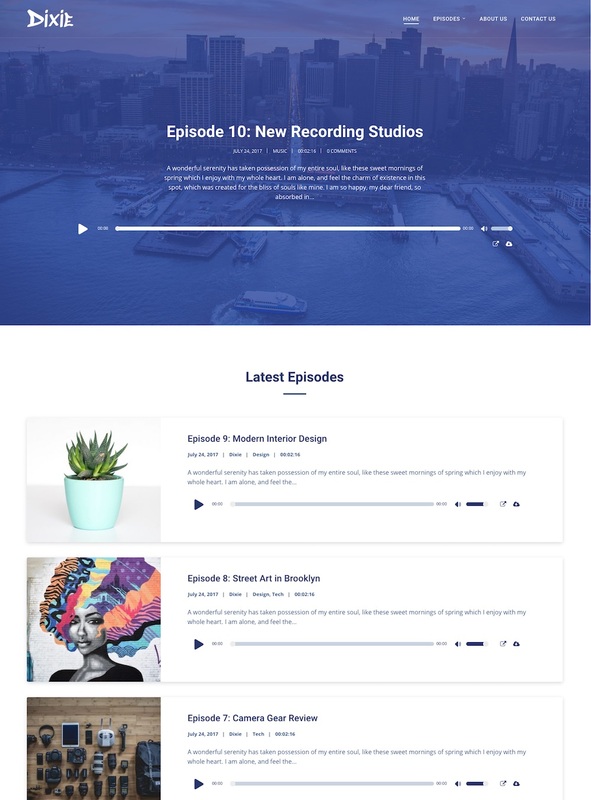 Bolden is a flexible and stylish podcasting template perfect for individual podcasters, larger podcasting channels or podcast networks. 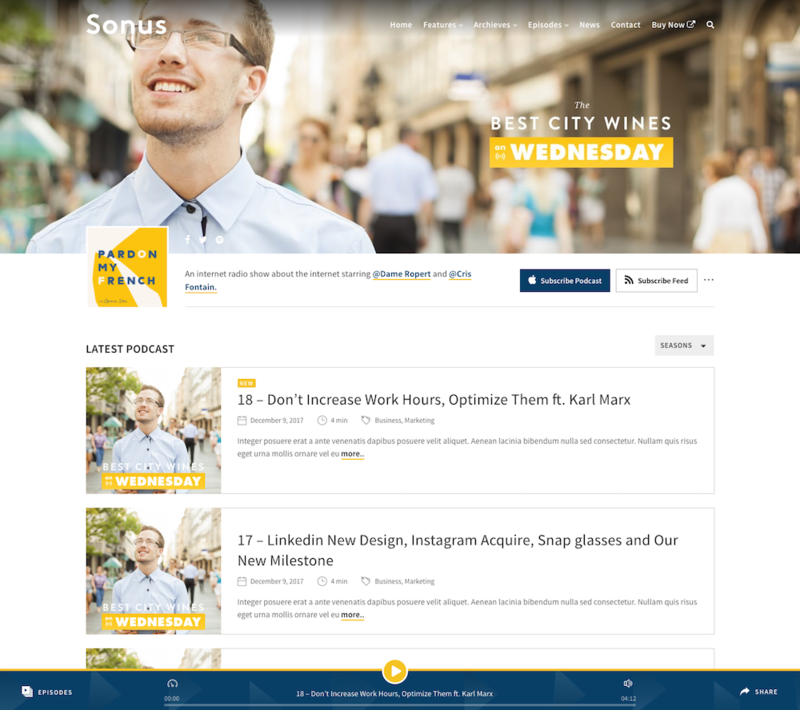 Sonus is a Podcast and audio WordPress theme designed for podcasters. It has a custom design and lots of cool features specifically for a podcast site. It comes with its own custom player so you can upload and host podcasts on your own site or embed podcasts from third party services such as YouTube, Spreaker, Soundlocud or other podcast providers. The theme also supports popular WordPress podcasting plugins including: Blubrry Powerpress, Seriously Simple Podcasting, Podlove Podcast Publisher, Buzzsprout Podcasting, Libsyn Podcasting Plugin. 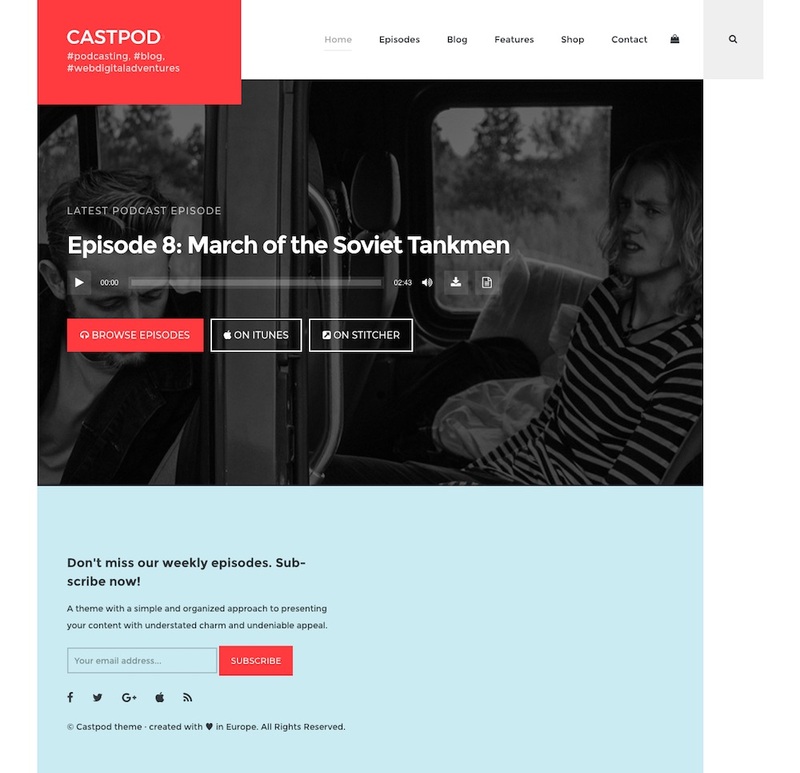 Castpod is a professional podcast WordPress theme. It has a modern and stylish design built specifically for podcasting websites. It has multiple options for displaying audio content and it has the ability to generate a RSS2 feed for any podcast service provider (iTunes, Google Play, Stitcher etc). The handy migration tool can be used to transfer a feed from a podcasting service or external RSS into your site giving you full control over the podcast. Other features include Podcast transcripts, Podcast statistics, WooCommerce support, Gutenberg editor ready and more. 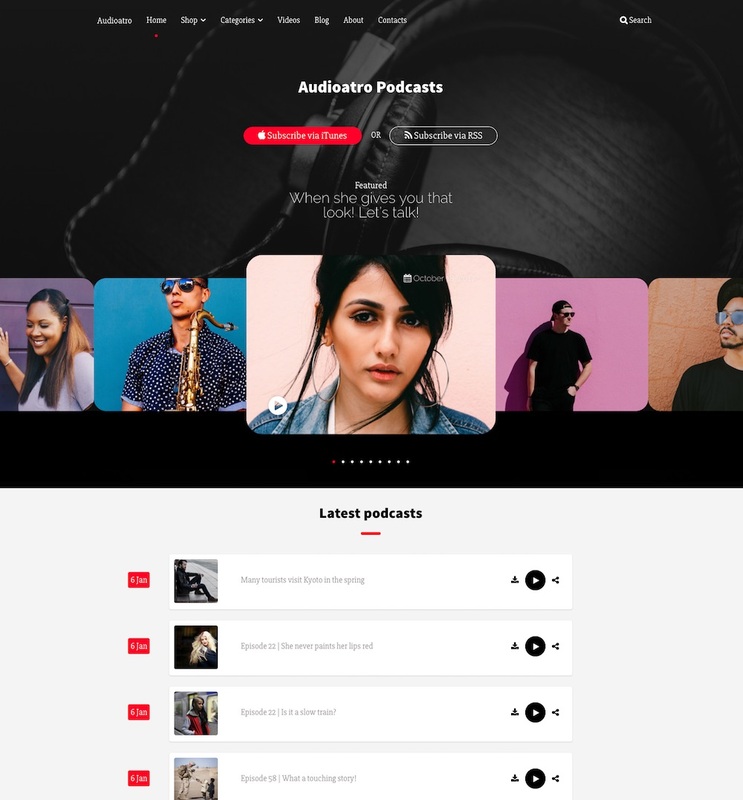 Audioatra is a multipurpose audio WordPress theme ideal for podcast websites or any type of radio, music, DJ, music artist or audio site. The theme has a couple of premade podcasting designs you can choose from and supports the PowerPress podcasting plugin by Blubbry. It includes support for both self hosted and external services for hosting your podcasts. Other features include: HTML5 audio visualization, showcase podcast presenters, lyrics pages, video pages, social sharing, Mailchimp newsletters, WooCommerce support and more. Dixie is an audio and podcast WordPress theme. It has a clean and modern design and offers a powerful set of features for podcasters wanting to build a robust Podcast website. It supports all the popular WordPress podcasting plugins such as: Blubrry PowerPress, Seriously Simple Podcasting (Castos), Simple Podcast Press, PodLove and more, while also supporting locally hosted files, external MP3 files and embeds such as SoundCloud, MixCloud, YouTube, Libsyn, PodBean, Spreaker and more. Design wise its fully customizable and comes with dozens of design options and unlimited colors to display your content in a unique and customized design. It also supports the Elementor page builder plugin so you can build any type of page and layout. If you’re looking for a clean and modern podcasting theme check out Dixie. 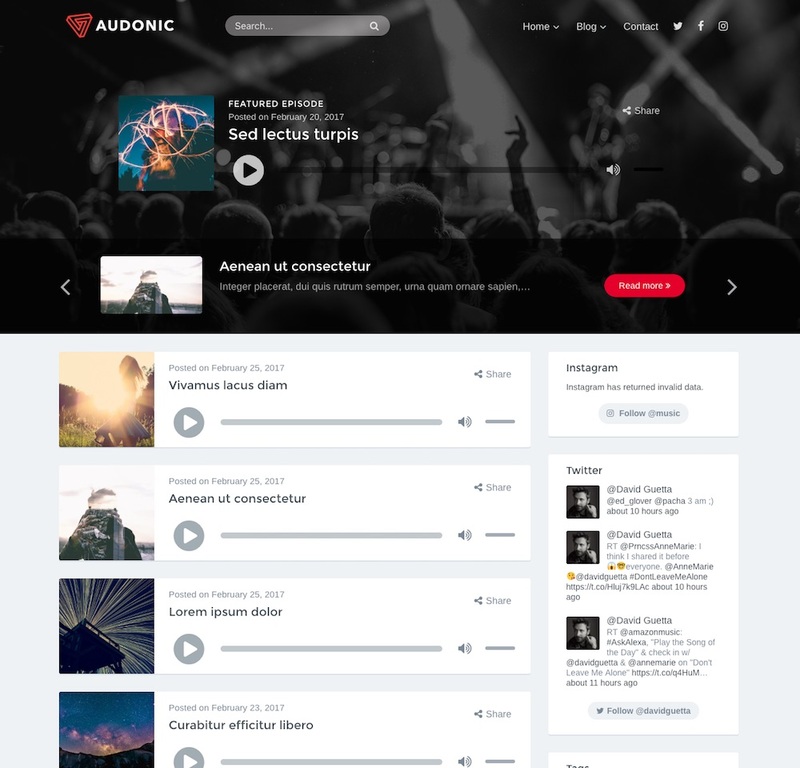 Audonic is a music and podcasting WordPress theme with an appealing design. The audio centric theme allows you to manage music, podcasts and videos. It supports native audio and video layers and well as oEmbed. The custom front-page welcomes your visitors and can feature your latest music and podcasts. Visitors can listen to or download your podcasts on the front-page. It also has custom podcast archive pages so visitors can easily find your older podcasts. It has design customization options and you can choose between light or dark styles. Podcasting is getting more and more popular. If you want to take your podcasting to the next level you need your own website to showcase your Podcasts. With your own website you can also provide more information about yourself, build a newsletter email list, grow your audience, sell merchandise and much more. WordPress is an excellent choice for a Podcast websites and the themes above will help you build the site quickly, easily and cheaply so you can get on with creating your podcasts. These themes look slick! Hopefully there are also WP podcasts plugin because installing a dedicated podcast theme might not be optimal for many bloggers. Let us know if you have any recommendation on the podcast plugins? Nice themes, I like it. Really all the themes mentioned in this post are amazing. I think every should podcaster try these themes.